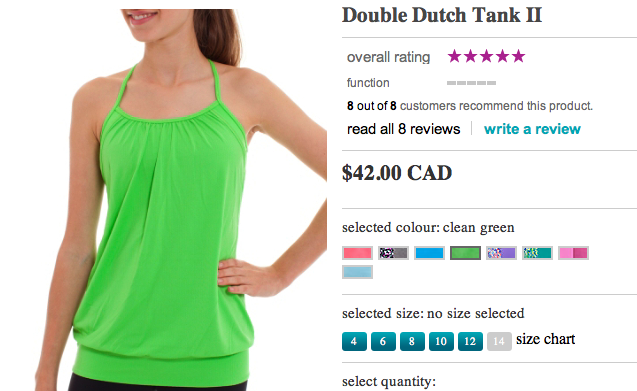 Over on the Ivivva site there is a Double Dutch Tank II (Ivivva equivalent to No Limit Tank) in Clean Green and I’m hopeful that means we may be seeing it come over to the grown ups side of lululemon, especially since we just saw Portapottie (reference to hotboxing porta poties?). We saw Power Purple over on the Ivivva side about a month before we got any items on the lulemon side and right now they also have items in Flash. The two sides sharing color palettes is pretty hit or miss but I think they should really consider capitalizing on the mother/daugther matchy-matchy outfits because that is really fun. haha not! but still, I’d love to see Clean Green, Savage or Portapottie make a comeback. My mall recently got a new store called Triple Flip which is pretty much an Ivivva store right down to luon tanks, headbands and jackets. It’s all pretty cute but the pricing is along the same lines as Ivivva, ever so slightly cheaper. I’d love to try some items out from them eventually but I need to get in there without the double stroller. Right now they have a lot of items in ‘heathered power purple’ which was what drew me into the store today. 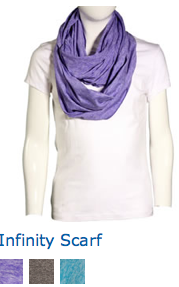 Low and behold I found a luon infinity scarf in heathered power purple (Pixie to them), bigger then the Ivivva versions, for $18. I was pretty tempted but decided to think about it since I’m not a scarf wearer. It’s a perfect length for an adult who doesn’t like a lot of excess fabric.